Immerse yourself in the rulebook that brings diversity to the old world; fighting Greek Hoplites with Napoleon’s Hussars, or Praetorian Cavalry with Templar Knights, or Elves with Dwarves. Defeat you're opponents with tactical prowess and superior skill. Using small to large units of troops, ranging from the Ancients to the Napoleonic’s and from any scale, you hope to weaken the enemy so that they flee, or are wiped out. Empires is suitable for all war-gamers, beginner or veteran; as the rules can be basic or advanced depending on how many upgrades are taken for each unit; and with over 16 unit types/variances, and more than 50 upgrades/modifiers, no battles will be the same. As a core rulebook, players are able to take the rules and expand on them, introducing new armies or wargear at their own leisure; to share with others and/or for their own entertainment. The Empires rulebook is a guideline only. You take control of the game. 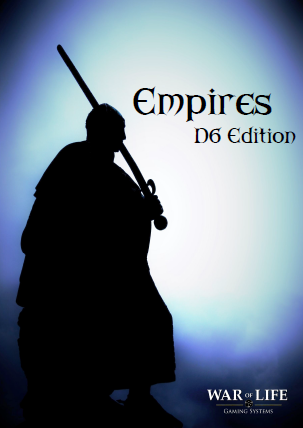 Empires: D6 Edition follows from the popular Empires: Core Rules rulebook, but with one BIG exception, a diced wargame mechanic.